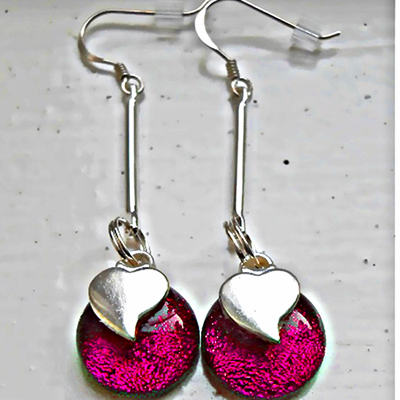 Long Dark Pink Dichroic glass earrings with a very pretty heart. They measure 5.5cm from the top of the Sterling Silver earwires. The glass pieces are 1.4cm in diameter and are made of two layers of glass. A layer of Dark Pink translucent art glass, topped with a layer of translucent Dark Pink Dichroic glass. The narrow silver plated connectors are 2.3cm x 1mm and are connected to the earwires with Sterling Silver split rings. They come in a Black card giftbox.